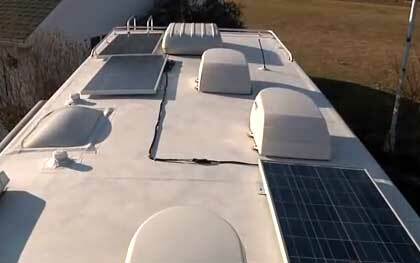 Did you think about installing RV motor home solar panels? For many people camping is getting away from everyday life and enjoying the freedom that nature has to offer, but most of them still would like to enjoy the comfort of home. This implies using everyday home electrical equipment such as TV, microwave, refrigerator, lights, laptops and all other appliances that one would love to bring along on a distance trip. Since the consumption of power in a camper is usually limited, very often it is almost impossible to use several electrical units at the same time more and more campers’ owners begin to recognize the advantages of solar panels. Having solar panels in your camper has many benefits while you are on the trip - starting from being environmentally friendly (something that we should be proud of) to being at least partially if not totally self-sufficient. Solar panels allow you to go and spend time at some campsites that don’t provide hook ups (for example rustic camps), on parking lost (if you make a stop) or even you can camp at some spots in the wilderness far from the “civilization”. Please note that there are also campgrounds where it is forbidden to use generators (silence is “golden”!) if not during a day, then certainly during the night. There are several types of solar panels for campers ranging from small solar panels for charging batteries to larger solar panels which can provide power needed by bigger appliances. Such bigger panels can power high wattage electrical units as TV sets, air conditioner, refrigerator, microwave oven, satellite receiver and other electronic and electrical appliances. Some are designed to be installed more or less “permanently” on the roof of your camper (suction cups in case you want to take them down for any reason (traveling, maintenance, cleaning etc..). Roof-mounted solar panels have their pros and cons. The obvious advantage comes from the fact that you can get the electrical energy during daytime driving (provided sun is shining!). And if you do not need the energy at that time, do not worry, it will not be wasted but stored in camper’s battery. However the roof-mounted solar panels have obvious disadvantage – you have to make sure that you park your RV at the site where it will have direct exposure to the sun (so forget the wooded sites offering the natural shade). This not only deprives you from shade and freshness but actually increases your need for energy. Simply speaking - during sunny summer days, you may need more energy to run your AC. And that directly “contradicts” the whole idea of being “environmentally friendly” and self-sufficient! Also, unless these solar panels have the tracking system, you have to park your RV in the best orientation towards the sun (not always possible). And anyhow, it will not be optimal position for the whole day unless you will be willing to change orientation of your RV to follow the sun! Most solar panels belongs to the class of “portable” units that you set-up once you are at your destination site. The obvious advantage is that you can set them up in the best place near your camper and in most efficient way (sunny area and orientation towards the sun). Usually the Solar Panel System is not “sophisticated” enough to track the sun, so be ready to change panels orientation from time-to-time to follow the sun. If that is the problem, you may also purchase the tracking system, offering you the “set-and-forget” option, although it comes at an extra cost. The Solar Panel System is connected to your camper’s electrical installation by the electrical cable (usually long enough to give you flexibility). unfortunately, you are exposed to theft (at least in some areas). 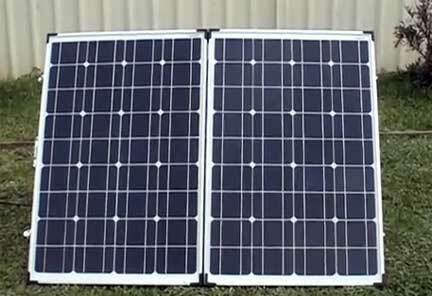 Solar panels come in different sizes with typical power ratings from 20 watts to 120 watts. Please note that the “installed power” (power rating) is not equal to the “generated power”. The former represents the maximum power possible to generate in best weather and best “state of the panels” conditions. The latter depends on the intensity of the sun and will vary greatly depending on weather conditions (sunshine, clouds, rain etc…) with obvious Zero Energy during the night! Panels’ “state” corresponds to the eventual dust accumulated on their surface and gradual degradation of solar cells with time (nothing lasts forever). Some modern solar panels for campers are shock resistant and as such are adequate for rough terrain. In general solar panels convert sunlight into 12V direct current (DC) electricity enabling you to store it directly in camper’s battery (batteries). If your appliances need AC power, then you will also need the converter to transform the low voltage DC current to the AC one at 110V(typical option for regular home application). When first solar panels for campers appeared, they were very expensive but over a period of time their prices came down significantly and now they can be purchased at very reasonable price. Currently, modest solar panels can be bought for $200 to $900 and their installation is very simple. The biggest advantage of having solar panels while camping is the freedom that they provide. The bottom line is – modern solar panels will provide your camper with electrical energy as long as the sun is shining. If you do not use all of the generated energy during a day, the excess of it will be stored in batteries for the evening and night. Considering all the benefits that solar panels provide, you will realize that they are very practical and handy and many people who cannot resist the outdoors will find comfort everywhere they need power. We have all driven past homes that used solar power to, at least in part, power electrical devices and systems. You may have wondered why you couldn’t use RV motor home solar panels. The fact is you can. There are solar panels suitable for just about all RV’s. Our friends Jack and Nan have a one year old motor coach for which they purchased a solar panel. It allows them to recharge and increase the life of their 6 and 12V batteries. They kept their generator since they are full time Rvers. They need to have a back up for a stretch of time with little or no sunshine. With all of the different kinds of RV’s, from luxury motor homes to van campers, it is difficult to find a “one size fits all” solar panel. You would be wise to find a company that installs custom solar systems. That way you won’t have to choose between TV or heat or risk losing the food in your freezer. There are both rigid and flexible solar systems available. Confer with your dealer as to which is suitable for your recreational vehicle. You can also buy a solar system designed to be a complete power system for mobile homes that lack the ability to convert AC conversion capability. There are formulas you can use to figure out the solar power requirements of your mobile home. To make these calculations you will need a calculator, weather almanacs, paper, pens or pencils and internet access. 2. Multiply consumption rate of each appliance by the number of hours a day it will likely be used. 3. Divide this number by the total output of your solar panels. 4. Determine the storage capacity of your batteries. 5. Use the internet or weather almanacs to learn the average number of sunny days in the area you plan on visiting. 6. Install another battery if needed. 7. 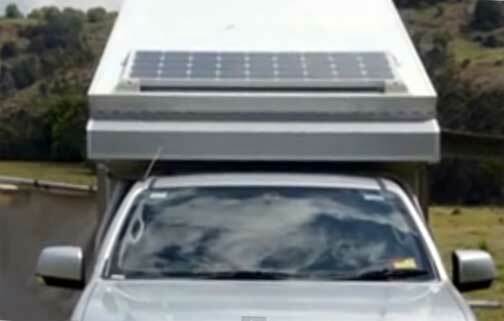 Position the solar panels flat against the roof of your RV. The formula for getting amp hours is the number of amps per hour multiplied by the number of hours an appliance will be used. For instance a single light uses 1.5 amp x 6 hours would be 9.0 amps per hour. A TV uses about 1.4 amps per hour, so 4 hours would require 8.4 hours. This is a time consuming task. Ask your solar company for help. If you transport your RV in a hauler that will not put a burden on your RV motor home solar panels.